The arsenals of dozens of Iowa law enforcement agencies now include crime-fighting tools from the U.S. military, but on Monday, President Obama put an end to the Defense Department’s sale or donation of some of that equipment. Iowa Senator Chuck Grassley says in most cases, local police departments don’t need grenade launchers or tracked assault vehicles, though he notes, there are always exceptions. “Three years ago, when you’re in the Boston Police, going around Boston trying to find a couple of people that killed five or six people at the end of the Boston Marathon with bombs and you don’t know how many bombs there might be in the city, having some of these armored vehicles to protect the police may be the right thing to do,” Grassley says. Some Iowa City-area residents voiced concern last year when the Johnson County Sheriff’s Department acquired a 60,000 pound M-RAP, or mine-resistant ambush-protected vehicle. Grassley says perhaps those types of war machines should be handled on a case-by-case basis. 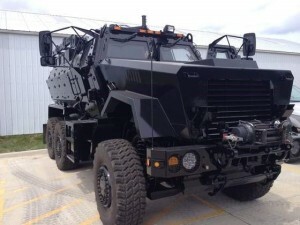 Reports say more than 140 Iowa law enforcement agencies have gotten all sorts of military gear in recent years, including seven grenade launchers, more than a dozen mine-resistant armored vehicles, and more than 700 M-16 assault rifles.